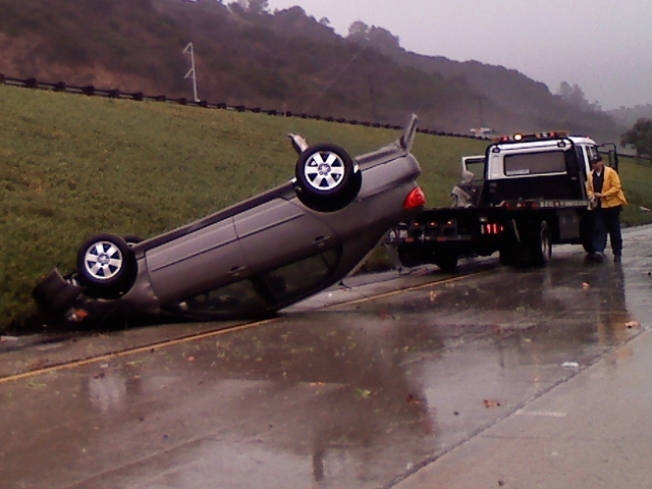 Accidents peppered the highways around San Diego County Monday. Heavy rain throughout the day added a windy punch in the afternoon around San Diego County, with blizzard conditions possible at higher elevations. Earlier in the day, forecasters from the National Weather Service warned county residents to be ready for gusts up to 55 mph along the coast -- with higher winds possible in the mountains. A major power pole was knocked down in City Heights during the afternoon. Officials were urged to "de-energize" it as soon as possible because of its proximity to a tree and a nearby recycling yard. Power lines were also knocked down in La Jolla on Vista Del Mar. A third incident was reported on Old Milky Way between San Pasqual Way and San Pasqual Valley Road. It's not clear how many customers were affected in those three areas, but San Diego Gas & Electric did say at about 3:30 p.m. that 18 power outages affecting about 7,300 customers had taken place around the county. 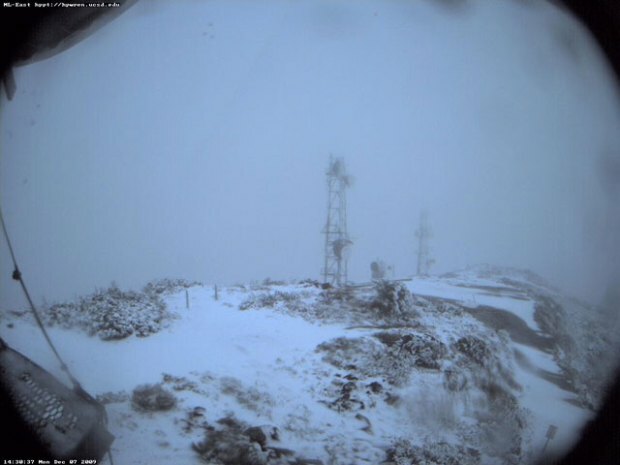 In the mountains, residents were concerned that the early snow that fell relatively peacefully on Mount Laguna would give way in the afternoon to possible blizzard conditions above 4,500 feet. With inches of rain forecast at lower elevations, several feet of snow seemed possible farther up the mountains. The driving was treacherous around San Diego. By 10 a.m,. 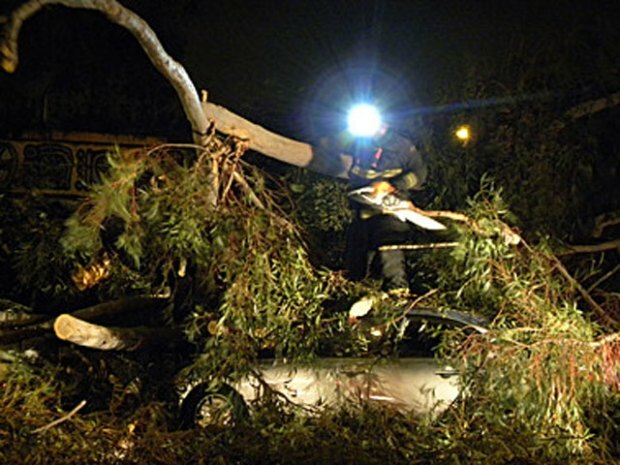 the California Highway Patrol said there had been 121 crashes in the area, as opposed to 50-75 on a normal day. By 4 p.m., 250 accidents had been reported since midnight. In the morning, a tractor trailer jackknifed into the center divider on southbound Interstate 5 at Sorrento Valley Road, snarling the morning commute, then six hours later on northbound Interstate 15 near the interchange with Interstate 8, a big rig went completely off the freeway, landing in trees and partially collapsing the semi's trailer. Passenger vehicles were reported flipped over as well, including a late model sedan on I-5 north in the morning and a Toyota Tacoma on Interstate 805 south near Interstate 905 later in the day. San Diego police urged drivers to to drive with their headlights on and not go around barricades where water was rising. By early afternoon, the San Diego River had prompted the closure of Fashion Valley Road in Mission Valley, where the waters easily overran the road on their way to the sea. Flooding was reported around San Diego, including down in South Bay, where roads overrun with water included San Miguel in Bonita, Airway and La Media in Otay Mesa and Hollister Road in the Tijuana River Valley. Shortly before 4 p.m., the Swift-Water Rescue team from the San Diego Lifeguards was called to the Sweetwater River in National City after two people became trapped by the rising water. Both were rescued and were able to walk away unharmed, officials said. The flooding in the Tijuana Estuary prompted health officials to issue water-contact closures due to bacterial contamination for south county beaches, including Imperial Beach, the Silver Strand and the Coronado ocean shoreline. The worst of the storm was expected to mostly pass through the county by midnight, with thunderstorms possible during that time. A breather follows on Tuesday and Wednesday, with temperatures staying cool and highs in the upper 50s. Then, between Thursday and Sunday, another system is expected to arrive, with two fronts possible during that window of time, bringing more moisture to the very dry region.